When you learn Spanish, you quickly discover some tricky verbs right? For instance, have you ever mixed up the Spanish verbs llevar and traer? If so, you're in good company. I still sometimes mix up confusing verbs like this, even after years of learning Spanish. But llevar and traer are two key verbs that will help you sound more natural in Spanish if you know the difference between them. The good news is that with one simple strategy, you'll never mix them up again. Even better, you can use your knowledge of English to master these verbs. What's not to like!? By the end of this post, you'll understand why you're mixing up llevar and traer. And you'll know exactly what to choose the right verb when you speak Spanish. If you prefer watching videos, you can watch me walk you through the explanation. Or just scroll down and read about one easy way to remember the difference between llevar and traer. 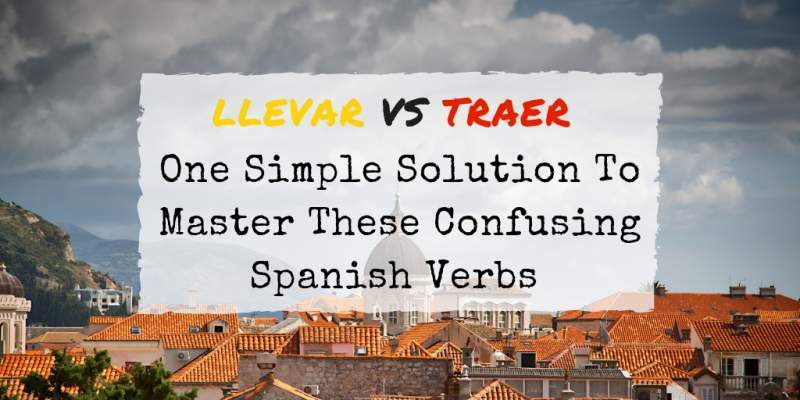 Llevar vs. Traer : Why Are These Spanish Verbs Confusing? A lot of it has to do with the way we use the verbs “bring” and “take” in English. In English, we tend to use “bring” and “take” interchangeably. You might say either statement in English at home, at work, or on the train itself and they would both make sense. In Spanish, on the other hand, the verb changes based on where you are. Your location completely dictates whether you should use llevar or traer. You do have the book, but it's up in your room. So how would you answer? Which of these options do you think is correct? Or is it, Sí, claro. Está en mi habitación. Ya lo traigo? I'll tell you the answer at the end of this article. First, I'll explain how you can know which verb to use every time. 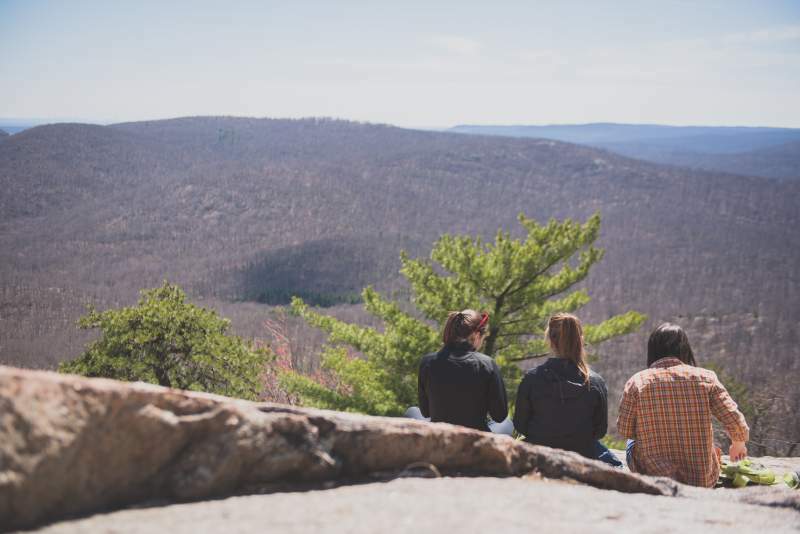 Even though we often use “bring” and “take” interchangeably in English, there are some situations where really only one verb makes sense. Let's use the example of eating out at a restaurant to show the difference. If you want something else to drink, do you ask your waiter to bring or take another glass of water? The answer is obviously “bring”. Anything else just sounds odd! What about that empty plate left at the table? Will your waiter bring or take it away? Here, the answer is always “take”. That's because technically, even in English, “bring” implies movement toward something (“Bring us the bill, please.”) while “take” implies movement away (“Would you like to take the rest of the meal home?”). Knowing which verb to use will feel intuitive to you if English is your first language. But you may have to work a bit harder at knowing the difference in Spanish. The difference is that in English, we often use “bring” when we technically should say “take”. In Spanish, there is little to no overlap. This next example should help clarify the difference between llevar and traer. In the first sentence, Jorge uses traer because the object being transported (in this case, las cervezas) is travelling from somewhere else to where he is. 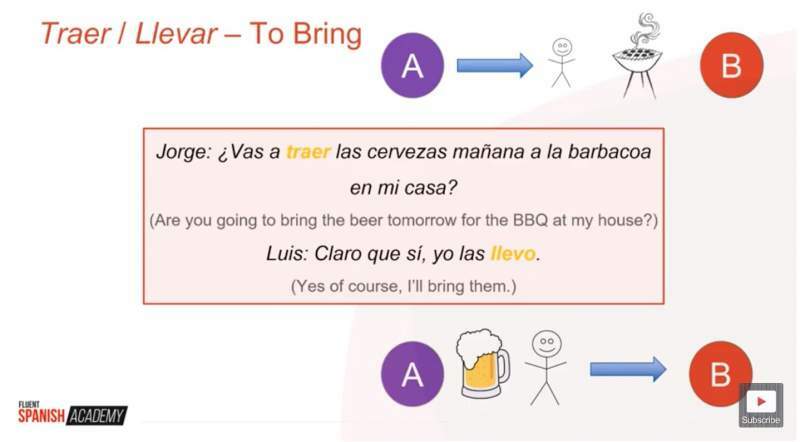 The response (by Luis) uses llevar because Luis will bring the beer from where he is to somewhere else. That distinction is all you need to know to figure out whether to use llevar or traer. If the beer is moving from Point A to Point B, Luis is at Point A and Jorge is at Point B. If the subject of the sentence is at Point A with the object in question, use traer. 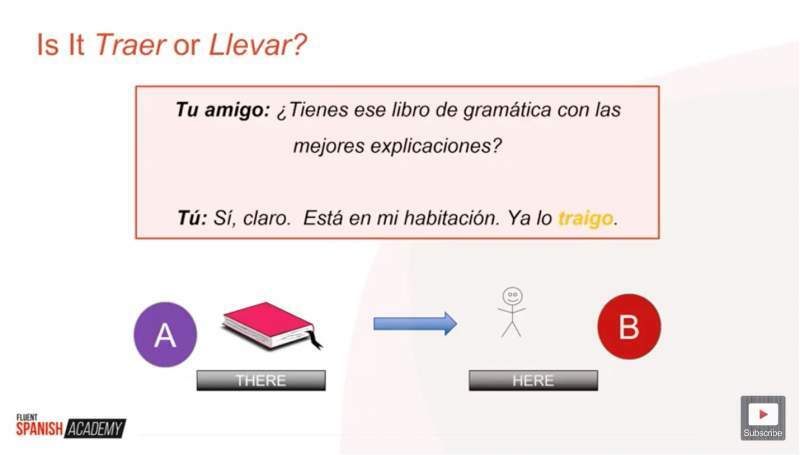 If the subject of the sentence is at Point B, either the final destination or somewhere else entirely, use llevar. Let's look at an example of each verb in use to further explain the distinction. Imagine you're sitting in a Spanish class waiting for the teacher to arrive. 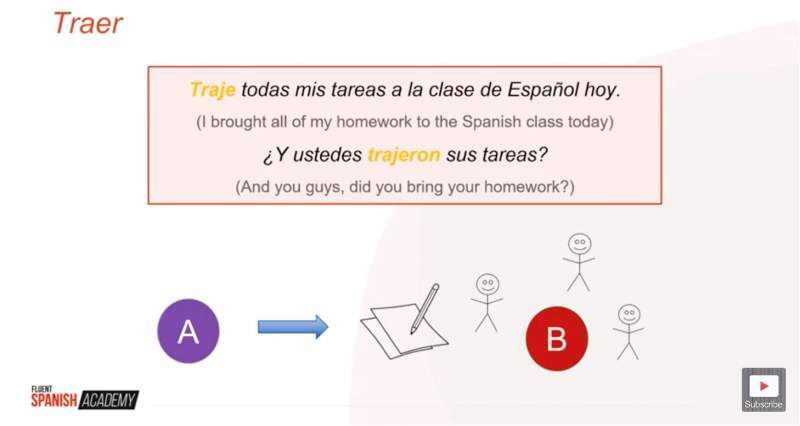 In both of these sentences, you would use traer because both in both situations, the homework was brought from somewhere else (Point A) along with the subject to where the speaker is now (Point B). Carmen and Pedro are at home discussing their children. 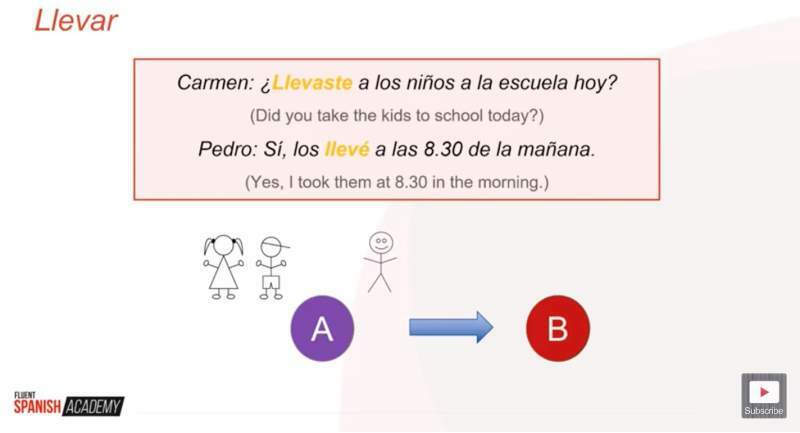 In this situation, llevar is the correct verb because the objects in transit (the kids) were taken somewhere other than where the conversation is taking place. You can also think of it in terms of here vs. there. 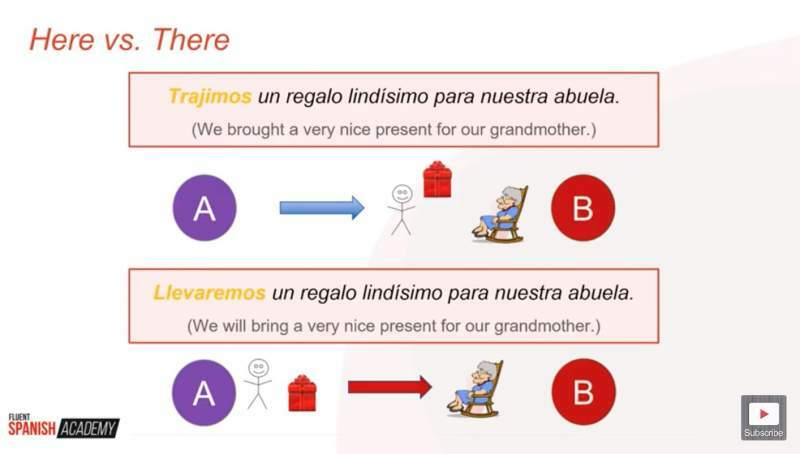 Let's look at two sentences that describe basically the same situation: visiting grandma and giving her a present. As you read these examples, keep in mind where the subject of the sentence is in relation to the object that's moving (in this case, the gift). Because the sentence uses traer, it implies that we're currently with grandma and the gift. We brought the gift from Point A with us to Point B. The gift is here. In this sentence, llevar tells us that we're taking a present to another place (to grandma). The gift will go from Point A (where we are now) to Point B. It will be there. When we use traer, the subject (in this sentence, “we”) is at point B (here) with the thing being brought along from over there. Llevar is just the opposite. With llevar, the subject is at point A and they take the object with them to point B. The present is here with us the entire time. Let's go back to the original example and see if you can confidently tell which verb to use this time. You do have the book, but it's up in your room. Do you know how to answer the question this time? Which one is it? Llevar or traer? Well, where are you in relation to the book and where is the book going? The book is over there (in your room). You will go to Point A and bring it with you to Point B, where you are now (here). So we use traer. If at the end of the movement, the object is here with the subject, always use traer. Now that you know the difference between llevar and traer, stop worrying about it. Spending hours cramming in exercises and revision is not the best way to obtain a mastery of the verbs. 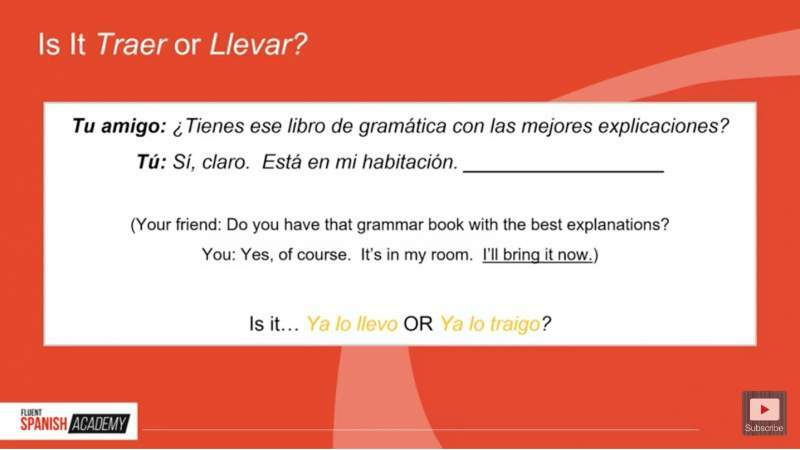 The more you see, hear, and use llevar and traer in Spanish, the more natural they will feel. 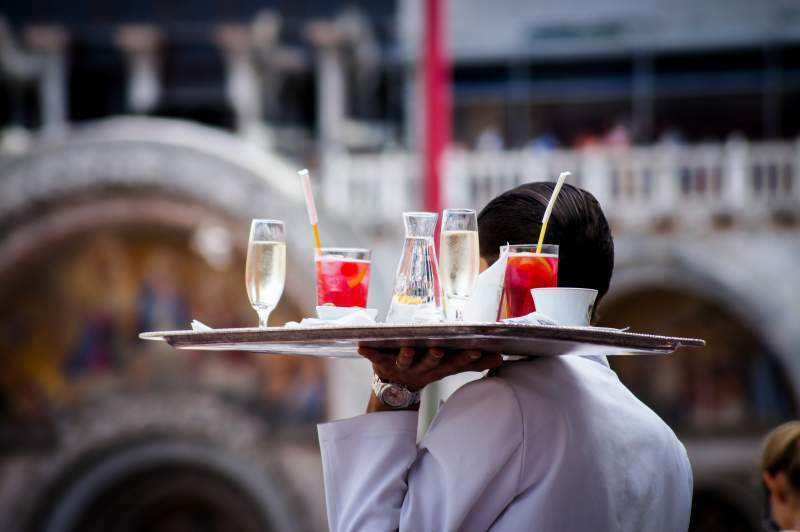 Use traer to ask your waiter to bring you something. Llevar is the verb you would use to volunteer to take a dish to a friend's buffet…and then traer when you are actually at the party and telling someone what you brought. These subtle distinctions in usage will start to simply sound natural to you with plenty of exposure. So your number one job at this point is to up your input and keep speaking Spanish every single day. You may still make mistakes. In fact, you probably will. But mistakes aren't the enemy of Spanish fluency. 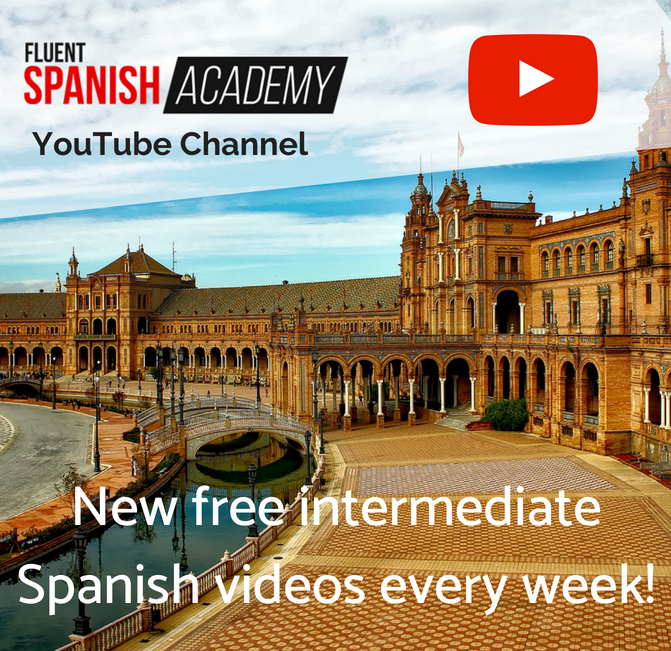 The more you are surrounded by and speak Spanish, the easier it will be for you to simply know which verb to use and when. Over to you. Is the difference between llevar and traer clear for you now? Are there any other verbs in Spanish that are confusing for you? Let me know in the comments below.